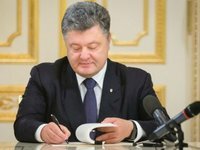 Ukrainian President Petro Poroshenko has said he signed a law that establishes a mandatory 75% share of Ukrainian-language content on television. "No one is against hearing other languages from television screens, but it is unacceptable that the share of the Ukrainian language on any Ukrainian channel is 15%, 20%, or 25%," Poroshenko wrote on his Facebook page. The Verkhovna Rada passed the bill envisaging the mandatory 75% quota for the Ukrainian language content in television and radio programs on May 23. From now on, programs and films shown in the official Ukrainian language should account for at least 75% of the entire national and radio television and radio content aired in the periods from 7 a.m. till 6 p.m. and from 6 p.m. till 10 p.m. The quota was set at 60% of programs and films shown in the state Ukrainian language in the same periods of time by local television and radio broadcasters. The law amended laws 'On Television and Radio Broadcasting', 'On Culture' and 'On Fundamentals of State Language Policy'. The law also establishes fines of 5% of the total amount of the license fee for television organizations which violate its provisions. The law will enter into force in four months after its publication. On May 23, the head of the parliamentary committee on freedom of speech and information policy, Viktoria Siumar, explained that the Russian-language television programs produced in Ukraine will be counted as part of the Ukrainian-language quota for TV channels for a year and four months. "The law [on quotas on Ukrainian television] will come into force in four months after its signing, but for a year programs produced in Ukraine will be counted as falling under the Ukrainian-language quota, even if they are in Russian, giving the channels time to switch to Ukrainian," she said. The politician stressed that this provision will apply only to Ukrainian-produced Russian-language programs, but never to the Russian products. In addition, all foreign-language movies should be dubbed or voiced in Ukrainian, apart from Soviet-made films. The latter will not be translated in Ukrainian, but won't be counted as part of the mandatory Ukrainian-language quota either, Siumar said.